The perfect supplement for your flock of laying hens: Vitamins and minerals support the overall health and vitality of your flock while added ingredients provide Omega-3 fatty acids, rich-colored egg yolks, and a healthy digestive system. Contains natural ingredients includes direct-fed microbials to help support digestion. 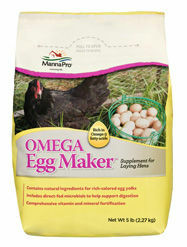 Supplement your birds with Omega Egg Maker and enjoy having a happy, healthy flock and gathering nutritious, delicious eggs.